SMST has been awarded a contract for the delivery of an Access & Cargo Tower to Spanish shipyard Astilleros Zamakona Bilbao. The Access & Cargo Tower, that combines a gangway and elevator for the handling of personnel and cargo from the vessel's warehouse to the wind turbine, will be installed on Esvagt's new Service Operation Vessel (SOV), that will perform wind farm maintenance work in offshore wind farm Deutsche Bucht for MHI Vestas. The SMST equipment enables safe and stepless transfer of personnel and cargo from vessel to the wind turbine up to a significant wave height of 3 meter. The landing height adjustment system of the Access & Cargo Tower travels to platform heights up to 23 meter. Together with the access system SMST's remote controlled Cargo Transporters are supplied to transport cargo of 400 kg from below deck, via different deck levels, to the offshore structures. Furthermore a 3t active heave compensated offshore knuckle boom crane is installed on top of the tower for the handling of heavier parts towards wind turbines or for deck and harbour handling. The Service Operation Vessel, built by Astilleros Zamakona, is designed and engineered by Havyard Design & Solution A.S in close cooperation with Esvagt A.S. SMST has developed a solution that provided excellent workability on a relatively small vessel, while having the lowest power consumption in the market. These solutions result in great efficiency gains, lowering not only the capital investment, but also the operational costs. 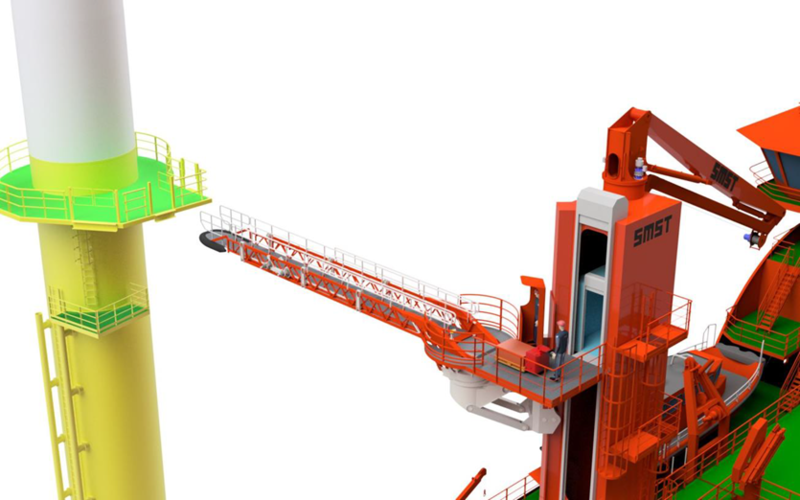 SMST's Access & Cargo Tower is part of the offshore systems that SMST develops and builds for the wind industry. The complete offshore wind portfolio includes a range of gangways adjustable for various heights, modular offshore cranes with 3D motion compensation, special handling equipment, seafastening frames and engineering studies.